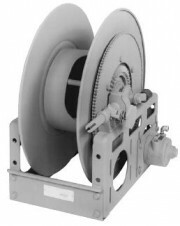 Spring rewind reel to handle live electrical cable. With spring rewind. Handles live 2 or 3-conductor cable. 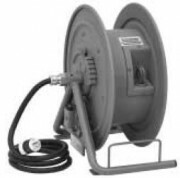 A 6-ft. power source lead of type SO cable, with 3-prong plug attached, is pre-wired to the reel. Handles from 70 ft. up to 80 ft. of 12/3 to 16/3 cable.